Place the flour, butter, salt, and confectioner's sugar in a food processor and process for 20 seconds. Add the milk and egg yolks and process for a further 30 seconds until a mass forms. Turn out to a lightly floured surface and knead lightly for a few moments. Flatten and form a disk. Wrap in plastic and place in the refrigerator for 1 hour. Roll out the dough with a rolling pin according to the recipe. Refrigerate until needed. 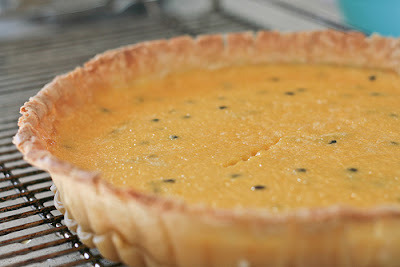 Put the passion fruit mix together the day before you wish to bake the tart (resting it in the refrigerator helps avoid splitting). Add the sugar and continue to whisk until well incorporated. While stirring gently, pour in the cream. Add the passion fruit juice and continue to stir until well blended. Cover and refrigerate overnight. Lightly flour a bench and roll out the pastry until it is 2 cm wider than the tart case. Roll the pastry over your rolling pin and gently ease into the tart case , pushing the sides in gently so that it takes the fluting. Rest in the refrigerator for 20 minutes. Line the tart case with foil, place rice in the foil and bake blind for 20 minutes. Remove the rice and foil, brush the tart shell with egg wash and cook for a further 10 minutes. Remove from the oven and lower the temperature to 140°C (290F). Return the tart case to the oven. With the case sitting in the oven, carefully pour in the passion fruit custard. Fill the tart right to the top with a cup or small dariole mold. Bake for 40 minutes. Check the tart, it should be halfway set but still quite wobbly in the middle. If you take it out too soon it will not set and run when you cut it; if you leave it in too long it will set too firmly ad lose its elegance. Through experience you'll find the optimum set for the tart in your oven. Remove the tart from the oven, balance on a cup and remove the sides. Put on a cake rack and, with a palette knife, slide the base off the tart tin. This will allow the tart to cool and the pastry to crisp up rather than sweat. Invert the pastry ring back onto the tart to help hold the sides in as it cools and sets. Allow to cool for 1 hour. Carefully cut with a serrated knife, dust with icing sugar & serve. I served this with a raspberry sauce.